(P1) Microsoft has just announced one of the biggest deals in its history, per the Telegraph. The company says it will buy LinkedIn for $26.2 billion in cash, or $196 per share, a 50% improvement on its closing price Friday, reports the Wall Street Journal. Microsoft says LinkedIn will “retain its distinct brand, culture, and independence,” while CEO Jeff Weiner will keep his post, reporting to Microsoft CEO Satya Nadella. The deal, approved by both boards and subject to approval by LinkedIn’s shareholders, is expected to close by the end of the year. (P2) “I’ve been thinking about this for a long time,” Nadella says in a video. “The LinkedIn team has grown a fantastic business centered on connecting the world’s professionals,” he adds in a release. “Together we can accelerate the growth of LinkedIn, as well as Microsoft Office 365 and Dynamics as we seek to empower every person and organization on the planet.” Weiner adds there’s “a lot of excitement” surrounding the deal, which will let both companies “dream big.” LinkedIn’s shares jumped 48% to $194.28 as the deal was announced, while Microsoft’s shares fell 3.3%, per Reuters. Do you use Linkedin? Why or why not? 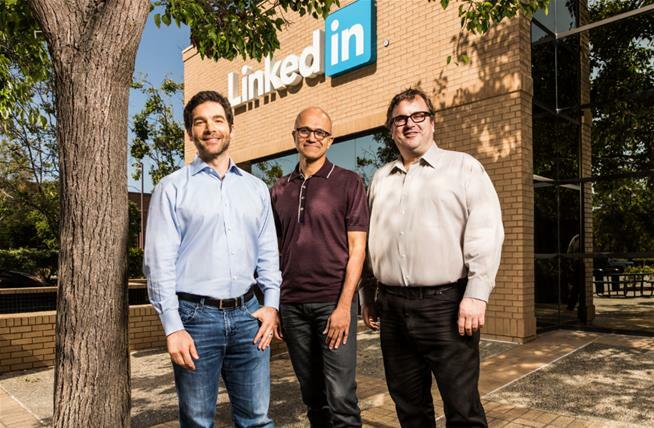 In your opinion, will the growth of Linkedin accelerate now that they are a part of Microsoft? Why or why not? Are there advantages to using the internet to find jobs? Why are why not? How much will Microsoft pay to purchase Linkedin? Who is the Chief Executive Officer of Linkedin?